Research at the Planetary and Space Science Centre at the University of New Brunswick includes investigation of meteorites from the Moon, Mars and the asteroid belt. We currently hold a number of Martian meteorite samples, as well loans of Apollo mission lunar materials from NASA. In addition, we are currently investigating selected lunar meteorites. Our research focus is on shock-related effects and the mechanisms that produce them. Central to this research is an analytical Field Emission Gun Scanning Electron Microscope (FEG SEM) and the micro-Raman Spectrometer. These instruments are located in the Planetary and Space Science Centre and are managed by the UNB Microscopy and Microanalysis Facility (MMF)and Senior Research Scientist, Dr. Lucy Thompson respectively (Contact Lucy). Click here for general information about meteorites. Click here for to see what typical meteorites look like. Click here for information about the different meteorite types. Click here for a photo gallery of "meteorwrongs". Click here to see latest meteor/fireballs reported worldwide or to report a sighting. 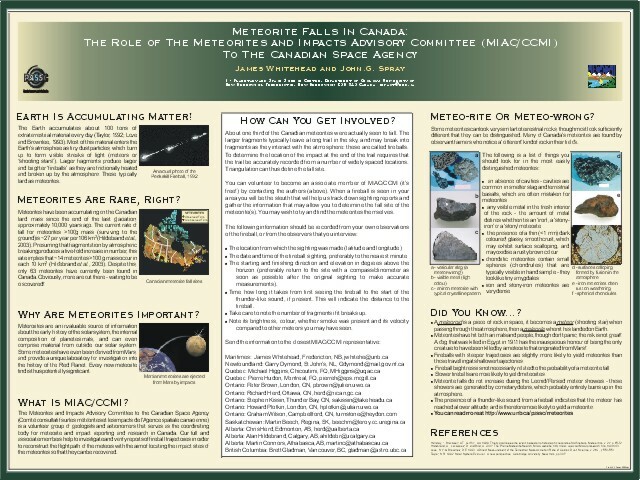 The following is the content of a poster presented by James Whitehead at the Geological Society of America/Atlantic Geological Society, March 2003, Halifax, Nova Scotia. A modified pdf version of this poster can be downloaded from here. NOTE: Webpage banner photography by Tata Tjahjadi (www.thewagyustory.com/blog).